Nonni Biscotti now has "Bite!" 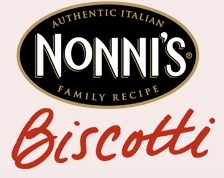 I have been a fan of Nonni brand Biscotti for the past 5 years. I would buy the giant tubs of the stuff at my local Big Box Store, and I would anxiously await my daily "biscotti treat" each afternoon with coffee. Needless to say, the wait was horrible, and I would devour the entire piece in one sitting. Now, with the launch of new Biscotti Bites, I don't have to wait all day to get my fix (or as I call it "Biscotti Moment"). If I want a small piece with morning coffee, and a small piece with afternoon coffee, and a piece before I go to bed (they are also good with milk), it won't ruin my eating plan. Since I have a hard time deciding what flavor to eat (they come in 3 scrumptious varieties), I can mix them up throughout the day, as well. Here is a view of the Caramel Milk Chocolate -- my fave -- with it's creamy chocolate edge and the chewy caramel bits inside. It's the sweetest of the three, and a real indulgent snack without the guilt of a rich full-size dessert. You can find all three flavors: Almond Dark Chocolate, Caramel Milk Chocolate, and Classic Almond, at your local retailer that carries Nonni. That's me -- working hard! You have until June 15th to enter the daily sweepstakes and weekly photo contest. What's your Biscotti Moment? *I wrote this review while participating in a campaign by Mom Central Consulting on behalf of Nonni’s Biscotti and received a product sample to facilitate my review and a promotional item to thank me for taking the time to participate.